The BLH Nobel brand of Vishay Precision Group, Inc. (NYSE: VPG), a leading producer of precision sensors and systems, including high-quality and high-accuracy weighing and control systems, today announced the addition of the BLH Nobel-1756-WM to its suite. The 1756-WM is a weighing module designed to directly plug into the Allen-Bradley 1756 ControlLogix chassis. Intended for inventory measurement and process control, the 1756-WM offers users simple configuration and is suitable for tank, silo, vessel and hopper weighing in the United States and Canadian markets. 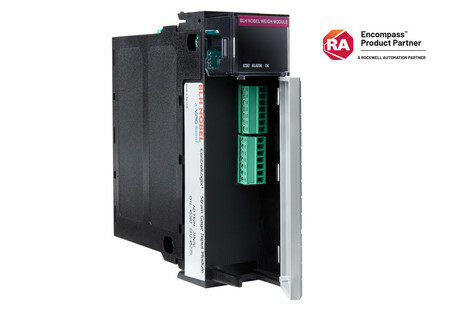 The weighing module seamlessly integrates weighing into the Allen-Bradley PLC by directly fitting into a single slot in the 1756 ControlLogix chassis via a screw connection plug. The weighing module is powered from the input/output chassis backplane and needs only the load cells for connection. Once in place and set-up, calibration and configuration for the 1756-WM are simply achieved through the Rockwell RSLogix 5000® PLC Development Software; no other external configuration utilities are required. Dual independent strain gage inputs—with sense inputs for six-wire connection—power up to eight 350-ohm load cells with up to four parallel 350-ohm load cells per channel. With a wide 32°F to 140°F operating temperature range, the 1756 weighing module’s six-wire system supports more exact measurement than dated, four-wire systems. Additionally, clear and highly-accurate data is ensured by one-millisecond strain gage inputs, as well as sophisticated digital filters that produce cogent and effective signals from the load cells. The 1756 weighing module is intended for industrial process applications in the food and beverage industry as well as pharmaceuticals. It is a significant product for a variety of OEMs and system integrators operating with the Allen-Bradley 1756 ControlLogix chassis. For more than 40 years, the BLH Nobel brand of VPG has specialized in the design, development and manufacture of high-quality and high-accuracy process weighing and force measurement technologies and related control systems. BLH Nobel load cells maximize accuracy and minimize the effects of mixing, agitation, and temperature changes within critical process stages. BLH Nobel products and customized solutions are designed to comply with stringent requirements in the food and beverage, pulp and paper, pharmaceutical manufacturing, medical equipment, process, mining, steel, and offshore industries. The brand further offers a wide variety of communication protocols for seamless integration within complex production lines. It also supplies system solutions, products, and services in more than 100 countries worldwide. Each BLH Nobel custom solution is derived from more than 40 years of engineering expertise, gained from across thousands of successful applications. For more information on these and other product offerings, visit www.blhnobel.com. Allen-Bradley, ControlLogix and RSLogix 5000 are registered trademarks owned by Rockwell Automation.